Bear once was the most powerful creature in the world. Bear was smart. Bear was strong. Bear was the master of FIRE. 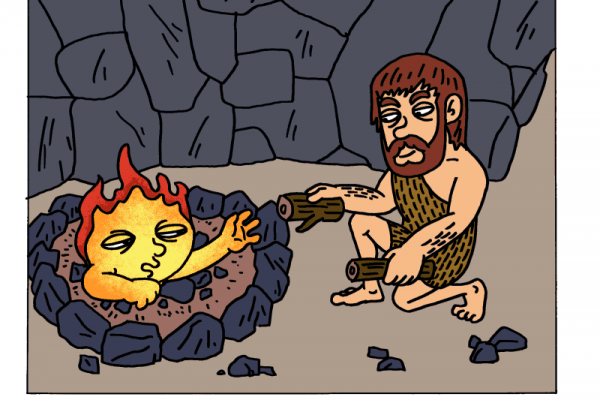 Bear was the only creature that knew how to light a fire and keep it alive so it would not go out. Bear always kept his fire burning. Fire kept his cave bright and dry. Fire kept other creatures away. They all feared fire. One day, Bear put his nose in the air. He sniffed once. He sniffed twice. He sniffed a third time. Then he walked to the opening of his cave. Bear smelled raspberries. He liked raspberries. Bear left his cave to hunt berries. He left fire burning inside a circle of rocks. But, Bear forgot to add wood to it, so it would not die. Bear walked into the forest and began to eat berries. The berries were so good that Bear forgot about the fire. "I need food," called fire. "Feed me!" Fire needed sticks or straw or anything that burned to stay alive. "Please come back and feed me, Bear, or I will die." But, Bear could not hear fire. Bear was far away filling his belly with raspberries. "Please feed me," called fire one more time. Only a few burning coals remained. Fire was almost dead. A man walked by and heard fire crying. "I need food, or I will die." The man pulled a handful of dry grass from the ground and placed it onto the hot cinders. Man had seen how the blowing wind caused fires to burn brighter. He bent down and gently blew on the coals. The grass began to burn. The man picked up dead pine cones and sticks and added them to the fire. Then he added larger sticks and dead branches from trees. Fire grew stronger and stronger. Fire allowed man to cook his dinner over its flames. Then fire promised to remain friends with man - to come live with him. Fire would light his home at night. Fire would keep man warm and dry. Man left to find a container to use to carry fire home with him. In the evening Bear returned home. His belly was full. But, now Bear was cold, and his cave seemed dark. Bear entered his cave and moved toward the fire. Fire turned away and would not make Bear warm. When Bear tried again to come close to the fire, it became hot and burned the whiskers on Bear's face. Bear pulled away in pain and ran into the forest. He did not try to come near fire again. Man soon returned with a clay jar to carry fire home with him. Man learned to light fire and how to keep fire burning and how to use fire in day to day life. Ever since that time the fire belongs to man.